The Flint Hills Nature Trail as it runs through Osage City, currently passable by walkers and bikers. A project to pave the trail was scrapped by the city council July 12. OSAGE CITY—The Osage City Council faced a roomful of citizens last week, most of which expressed concern about recent council decisions. Topics of public comment at the July 12 meeting ranged from the council’s recent rejection of a long-term project to construct a concrete trail through part of town to the ongoing disrepair of a section of Seventh Street. Most of the citizens who spoke about the trail project expressed similar viewpoints that they were disappointed the project had been canceled after years of planning and taxpayers’ investment of almost $300,000. 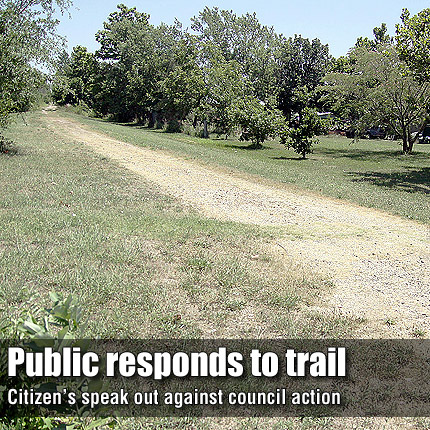 Before the meeting was over, the council heard from a representative of the Kanza Rails-Trails Conservancy the trail project would continue and eventually cross the city on the old Missouri Pacific Railroad right of way, but without city or state participation. The result will be a gravel trail instead of a concrete sidewalk as was to be funded in part by a state grant secured six years ago.